Ants can make a nuisance of themselves because they can nest both indoors and outdoors and the nest or entry points can be hard to find. If the ants are indoors, finding the entrance points will be extremely helpful in the ant control process as you will be able to seal them off to help prevent future ant infestations. Locating the nest outdoors can allow you to directly treat the nest for faster elimination. Easily one of the most annoying pests to have invade your home are ants! The first step in kicking them out is to know where to find them. In this video we will show you the basic places to check to get rid of and control your ant problem, just like the pros! 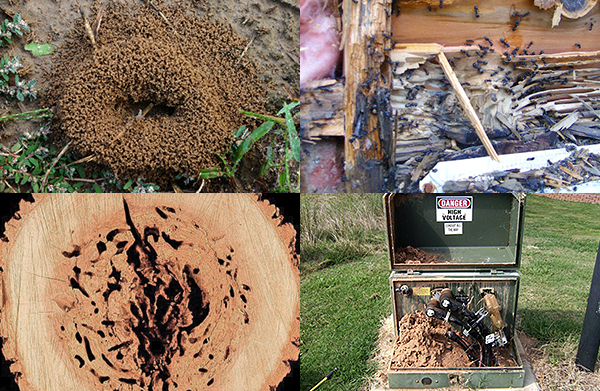 The first step in effective ant control is to locate the nesting area or entrance point of ants into your structure. A good place to start your inspection is in the kitchen and bathroom. Most ant species prefer moist areas to nest and hide eggs, so kitchens and bathrooms are typically the first areas to be infested. Use your flashlight to look for ants behind or under refrigerators, stoves, microwaves, dishwashers, sinks, and cabinets. Ants may also be found in or around floor drains, inside the motor areas of refrigerators and microwaves, behind wall paper, and in cracks and crevices in cabinets and around walls. If you are only finding a couple of ants here and there, try the following honey and peanut butter test to help attract the ants to one spot: first, place a jar lid or saucer near the area where you have noticed some ant activity. Second, place a half teaspoon of honey on one end of the lid and a half teaspoon of peanut butter on the other end. Third, leave the honey and peanut butter in place until the ants form a trail. The test not only allows you to determine where the ants are coming from, but which type of bait would work best in your ant treatment program. For example, if the ants went primarily after the peanut butter, a protein based bait will work best. If they went after the honey, you will be better off using a sweet feeding bait. And it’s that easy with the expert help from Do My Own Pest Control dot com. Make sure to subscribe to our channel for more instructional and product videos. Most ant species prefer moist areas to nest and hide eggs. Typically kitchens and bathrooms are the first rooms to be infested. Use your flashlight to look for ants behind or under refrigerators, stoves, microwaves, dishwashers, sinks, and cabinets. Ants may also be found in or around floor drains, inside the motor areas of refrigerators and microwaves, behind wall paper and in cracks and crevices in cabinets and around walls. If you are only finding a couple of ants here and there, you can do the honey and peanut butter test to help attract the ants to one spot so you can see where the trail of ants comes from and also to help detect what type of ant bait would work best in your ant treatment program. Place a 1/2 teaspoon of honey on one end of the lid or saucer and 1/2 teaspoon of peanut butter on the other end. Ants tend to be more nocturnal, so we recommend using your flashlight to follow the trail back to the nesting area or the area they are using to gain entrance into your structure in the late evening. If the ants are eating just the honey, a liquid or gel bait would be a good bait choice. If the ants are more attracted to the peanut butter, a granule or paste bait would be a good choice. You should note that as an ant colony grows and changes their nutritional needs will change. At some point they may only accept sweet or gel bait and at other times they may only accept protein or granule baits. You can perform the same honey and peanut butter test as described above to help you locate hidden nesting areas if needed. 616 of 646 people found this article informative and helpful.